There's nothing harder than the gut-wrenching heartache that comes from learning a loved one is sick. During times like these, the only thing that can make things better is having good food in your stomach. However, sometimes even comfort food at home, like a warm steaming bowl of chicken noodle soup, is not enough to stop your mind from running through the worst possibilities. Sometimes only lunch at a really spectacular restaurant can make things better--even if it means getting out of those sweats and putting make-up over tearstained cheeks. 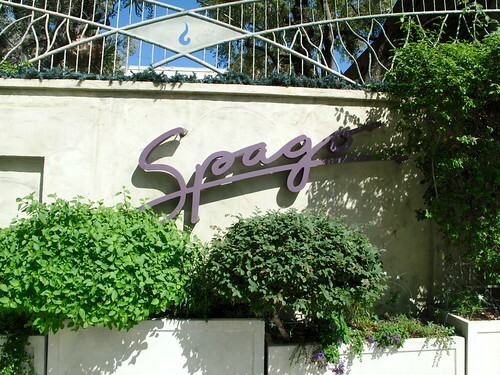 I chose Spago as our escape. From the moment we valeted behind a yellow Lamborghini and walked through the restaurant doors into a spacious bar area, we began feeling a more alive than we had in days. 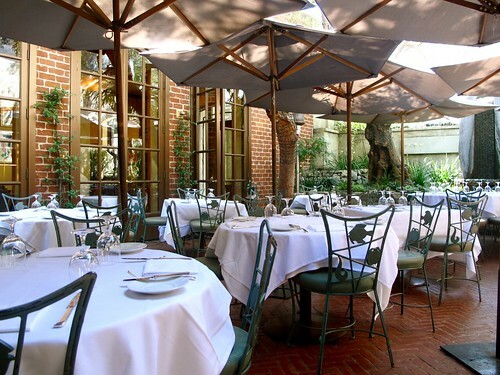 The hostess led us to one of the tables that spilled out from within the restaurant and onto the beautiful outdoor patio. The lavender umbrellas created a sense of seclusion from stress and worry, and the trickling fountain induced a sense of calm. The Beverly Hills crowd, with their tailored suits and quilted Chanel bags, exuded that quintessential L.A. glamour mixed with the laid-back vibe that only comes from being in California. As plate after plate of upscale Californian fare arrived with colors so vibrant and bright, my mom and I couldn't help but be a little more hopeful and a little more optimistic. A server came by and offered us a selection of bread. My mom and I both picked the lavash and olive bread. 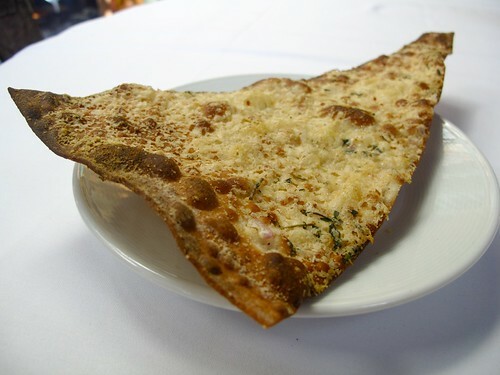 The crispy crunchy lavash bread was sprinkled liberally with parmesan cheese and herbs--resembling a large a salty, cheesy cracker. The olive bread was wonderfully soft and studded with kalamata olives. Both were actually very good. 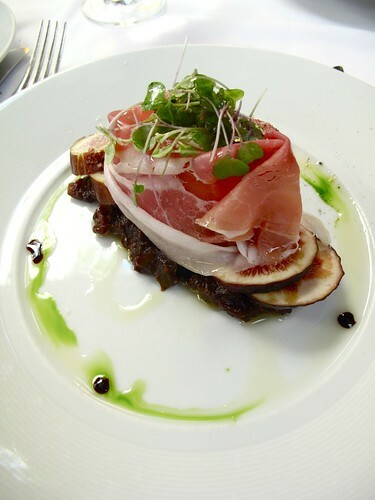 This was a delicious mix of creamy burrata, salty proscuitto, and figs done two ways--fresh, perfectly ripe disks, and a bed of sweet fig compote. I can never say no to burrata, and this was one of my favorite preparations. 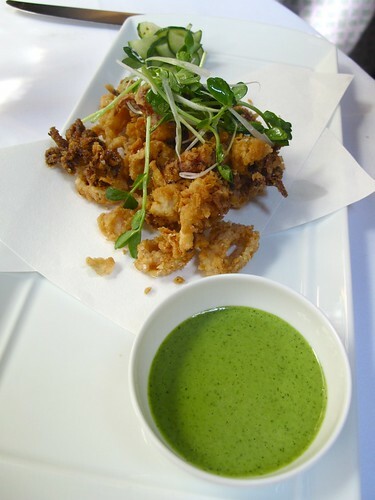 One of the main reasons I decided on Spago, out of so many choices for DineLA lunches, was because their menu offered fried calamari. My mom loves fried calamari. My mom loved this fried calamari. 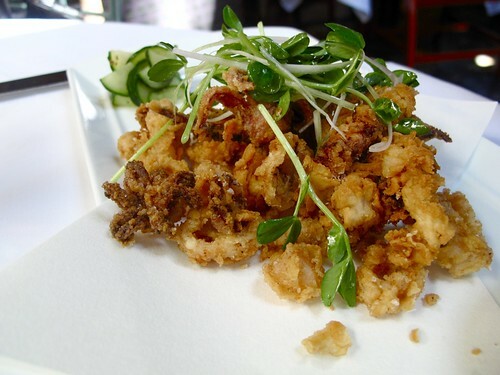 A lot of times, calamari can be kind of bland. This was boldly seasoned. However, I'm pretty sure it wasn't served with a black bean vinaigrette. It seemed more like an herb aioli. 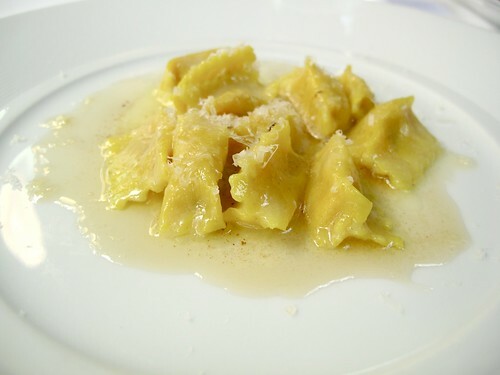 Spago always has some kind of agnolotti on its menu. The fillings change with this seasons and this pumpkin agnolotti literally tasted like fall. It was definitely a worthy supplement to the meal. 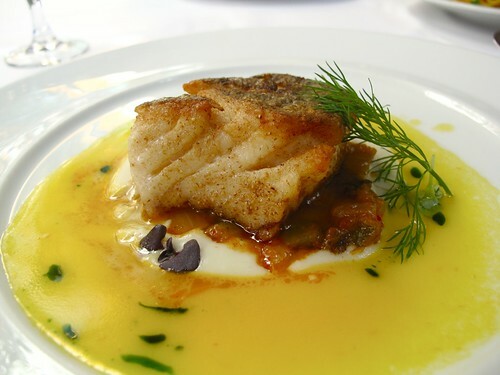 For my entrée, I chose the cod. It was the only dish we had that wasn't that mind-blowing. 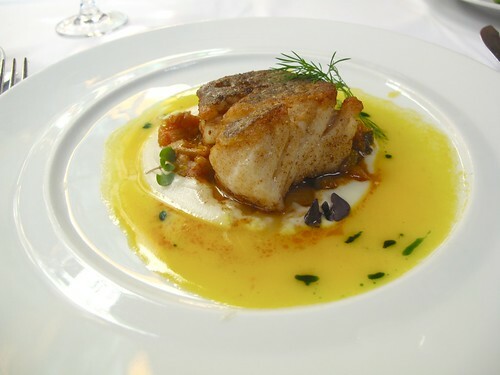 The fish itself wasn't overcooked or anything, it just did not have that much favor. 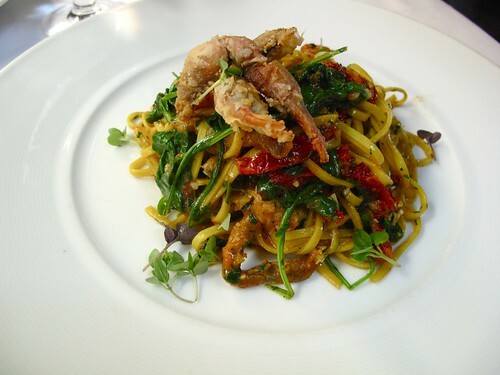 This dish itself was probably worth more than the $28 DineLA set menu price. 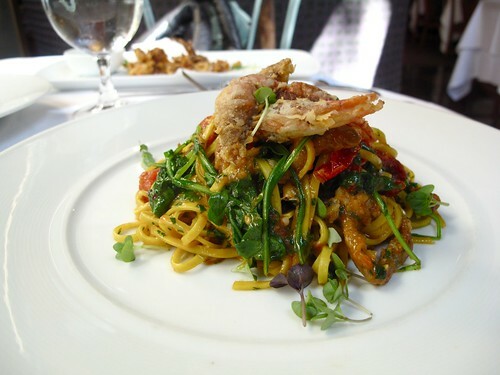 There were more than enough pieces of succulent soft-shell crab, hidden within the tangles of freshly made, al dente pasta. I enjoyed the subtle asian flavors in this pasta dish. 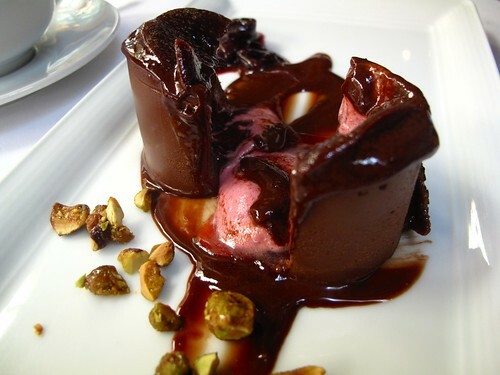 This dessert rekindled my love of chocolate. The chocolate shell was so smooth, so creamy, with a thin, crispy chocolate feuilletine on top. 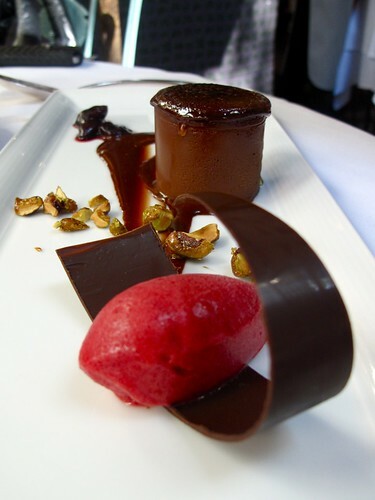 The cherry filling and the sorbet were both slightly tart, adding a nice acidic dimension to the chocolate dessert. It was very, very sinfully good. 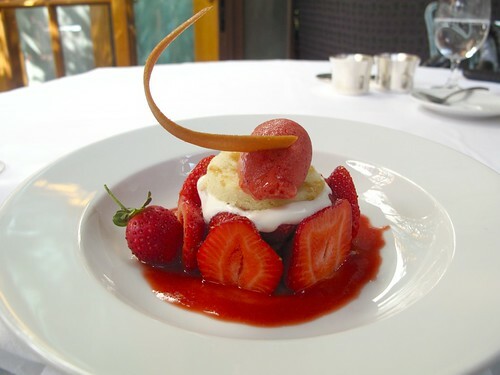 Unfortunately the adorable strawberry dessert was slightly less memorable when compared to the chocolate dessert. The strawberries were so ripe and so fresh. Very simple, but still very good. It seems Sherry Yard can do no wrong. I also had some desserts at WP24 that I really liked. We felt infinitely better after our meal. 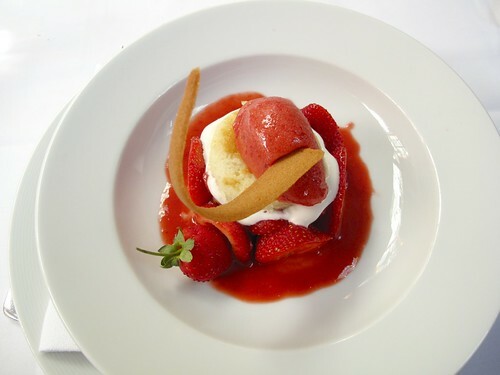 Everything, from the the attentive servers to the beautiful dishes, was just what we needed. Wolfgang Puck also came by our table and shook my hand. Yeah, I definitely smiled then. It's funny how just a satisfying meal can leave you feeling so much more optimistic about the future. I still haven't been to Spago. Sounds like it lives up to the hype! 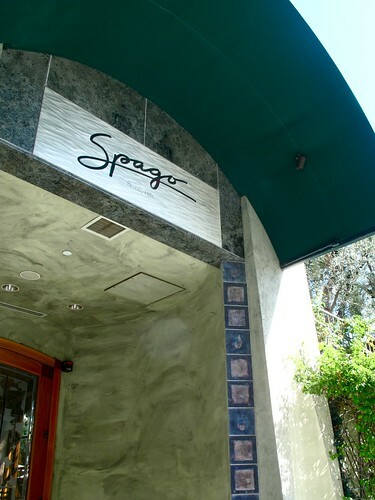 wow that looks really great.. i've never been to spago. 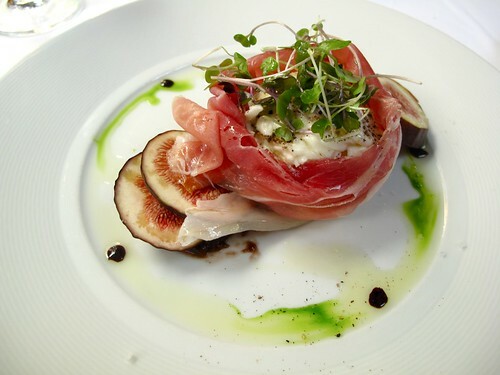 the burrata, proscuitto and fig appetizer looks amazing. hope everything is ok. I'm sorry for your sad news but I'm glad you were able to take comfort in this dinner & by the looks of it, it looks amazing! I especially love the bon bon! Too pretty to eat! Thanks everyone. It means a lot.